I am a mac-and-cheese GENIUS. An unexpected thing about being a parent is that I’m developing an interest in cooking. Specifically, I’m interested in cooking my kid’s food. I still have no interest in cooking for myself (or for you, sorry), unless the food is dessert. And not cake. But muffins are cool. The source of my new-found desire to cook is the simple fact that to prepare baby food you must start from the very, very beginning, and that relieves a lot of pressure to feel competent. There’s no measuring, no special tools with funny shapes, no recipe instructions that require explanation. To prepare yams to puree, you bake or steam them first. To prepare blueberries, you cook them down. Bananas simply need mashing. B-A-S-I-C.
And once you make it through the mush stage of baby food with your kid not once eating out of a store-bought jar because it’s so damn easy to make the mush yourself, it’s only natural to progress to more involved meals. Now, this is not to say I do all the cooking for Owen. Being a lapsed vegetarian, I don’t know that I’ll ever be comfortable cooking meat, no matter how comfortable I am feeding it to my kid. So Greg does a lot of the meat cooking. Also, he’s a great cook and he can multitask in the kitchen, which means he doesn’t create as much of a kitchen disaster as I do. And he’s way faster. But Sunday? Sunday I made macaroni and cheese without a powdered mix. With yam-and-carrot purees mixed in. And I mixed and matched from two different recipes to do it[1. One of them is from The Baby’s Table: Over 150 Easy, Healthy and Tasty Recipes Your Baby Will Love and the other is this.]. And my kid devoured it. That all makes me feel like a damned cooking genius, but that’s not why I’m claiming the title. 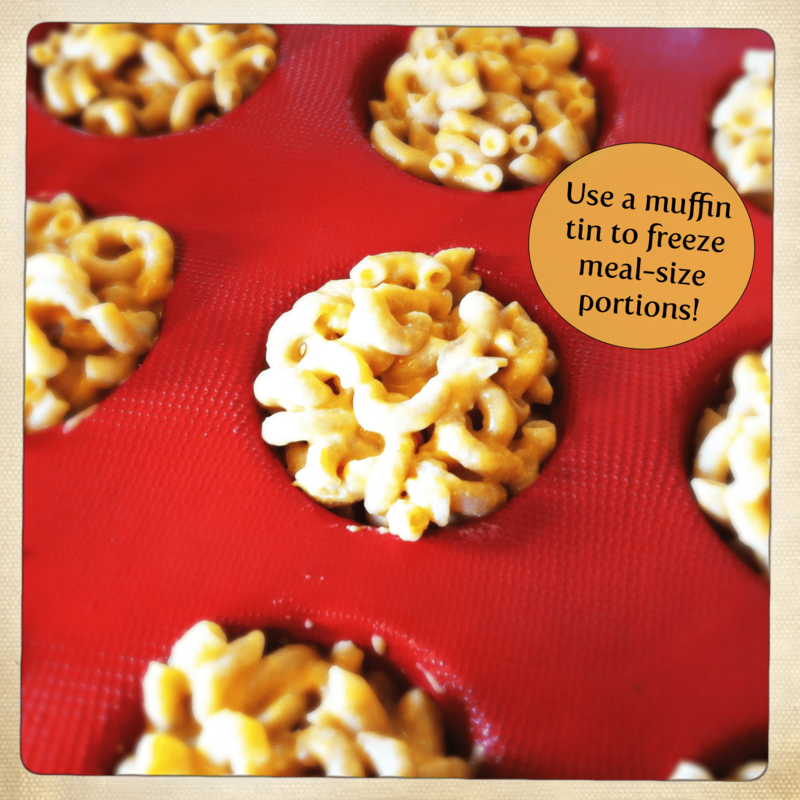 I’m claiming the title because I spooned mac and cheese into my muffin “tin” and froze toddler-meal-size portions. Which means my kitchen disaster will end up feeding my kid for a month. Oh yes. I’m feeling very pleased with myself.